Hello everyone!!! This is Cassandra from Creating with Color by Cassandra. I can't believe that April is almost over. Boy this month has really gone by fast. Well, today is my last project as a Guest Designer with Jaded Blossom. And you know I just HAD to do something with those colorful rainbows!!! Hee! I made 25 of these little cuties for an upcoming Copic Boot Camp that I am attending. You can't be crafty without chocolate right?!? ;) I used the Jaded Blossom ~ Goody Bag Die and the fun polka dot cardstock for each bag is from Core-dinations. For the yummy chocolates, I used the Jaded Blossom ~ Candy Charms & Banners and the Jaded Blossom ~ Pattern Candies and Jaded Blossom ~ Dream In Color. The inks for the candies are Hero Arts Shadow Inks ~ Red Royal, Orange Soda, Butter Bar, Green Hills, Pool, Soft Purple and Bubblegum. 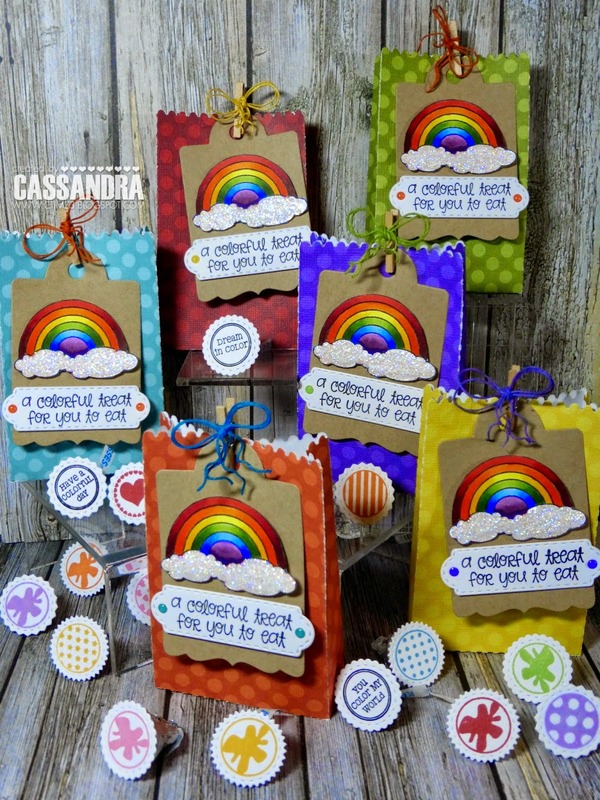 To decorate the fun goody bags, I used the Jaded Blossom ~ Treat Tag Die. The rainbow is from the Jaded Blossom ~ Rainbow Seeds and I colored that in using Copic Sketch Markers. I cut the white tag with the Jaded Blossom ~ Mini Tag Dies 2 and the sentiment is from the Jaded Blossom ~ Dream In Color. I also added some Star Dust ~ Stickles to the clouds for a little sparkle. Well that's it for me today. A big THANK YOU to Candace & Michelle for having me as a Guest Designer this month. I had an absolute blast!!! Have a great day everyone! These are awesome! 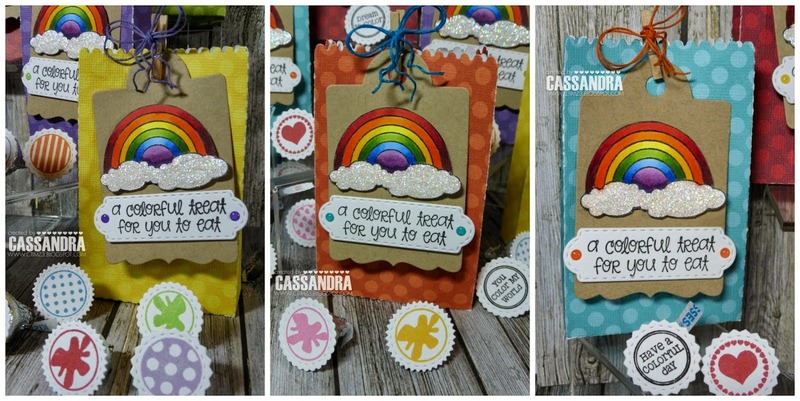 I love the fun colorful rainbows and adorable sentiments!! What a fun little treat for everyone. Great job!